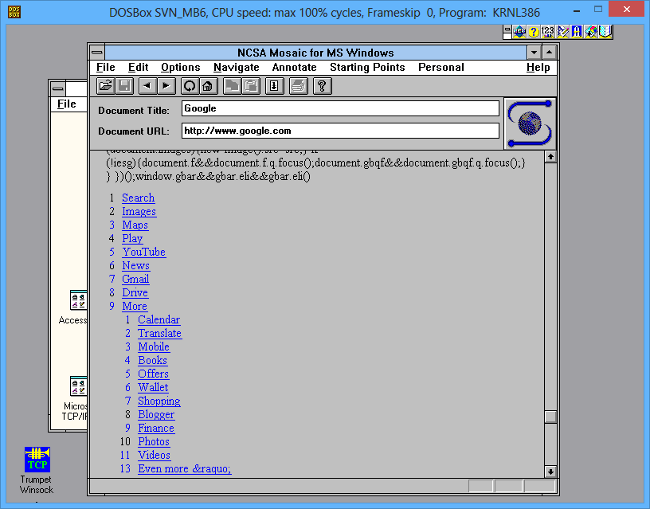 NCSA Mosaic - marking its 20th anniversary this week - was not the first web browser, but it was the first to be widely used. Tim Berners-Lee, who invented the web, describes its early days in his book Weaving the Web. Berners-Lee states that the first browser - WorldWideWeb - was text-based, and he had an early version working on his machine at CERN near Geneva by Christmas 1990. In August 1991, he released a version of this for the NeXT computer and advertised it on internet newsgroups. The first graphical web browser was Erwise, written by students at Helsinki University of Technology in April 1992. It was followed in May by ViolaWWW, also written for X Windows on Unix, built by a student at Berkeley called Pei Wei. Then there was Midas, from Tony Johnson at the Stanford Linear Accelerator Center, and Lynx, a text browser from the University of Kansas. All were interesting projects, but soon overshadowed by a project at the National Center for Supercomputing Applications (NCSA) at the University of Illinois. According to Berners-Lee, a manager there wanted a project for students to “show off their programming skills,” and having tried out ViolaWWW, got the idea of making a new web browser. The project was taken up by student Marc Andreessen and staffer Eric Bina. Berners-Lee suggests that Bina did most of the programming, while Andreessen gathered ideas, publicised test releases, listened to feedback, and added features. This was Mosaic. An early release was made public in February 1993, and release 1.0 was on 22 April 1993. Mosaic was a hit. The first version was for Unix, but Windows and Mac versions followed later in 1993 as NCSA realised its potential. Soon though, NCSA proved unable to keep pace with browser evolution. Andreessen left NCSA and in 1994 founded Mosaic Communications Corp together with Jim Clark, taking on key Mosaic developers from NCSA. NCSA later took action against the new company for using the same name. There was an out-of-court settlement, and Andreessen’s company became Netscape. The first Netscape browser followed in December, and soon eclipsed Mosaic. The influence of Mosaic does not only extend to Netscape. Eric Sink describes his time at Spyglass when the company licensed “technology and trademarks” (but not the code) from NCSA to create a browser for Windows, Mac and Unix. This was soon licensed to Microsoft and was the basis for Internet Explorer 2.0 in Windows 95. How good was Mosaic? Using the DOSBox emulator (the Megabuild version which has network connectivity via an emulated NE2000 NIC) I ran up Windows 3.11 with Trumpet Winsock and got Mosaic 1.0 running. It is credited not to Andreessen and Bina, but to Chris Wilson and Jon Mittelhauser, who wrote the Windows version. Wilson later joined Microsoft to work on IE, and is now a developer advocate at Google. Mosaic is recognisable as a web browser and includes a familiar spinning globe when it is retrieving data. The user interface is somewhat amateur. The fields for document title and URL, which look editable, are actually read-only; you navigate either by selecting Open URL from the File menu, or from one of the menus of shortcuts which are defined in mosaic.ini. As supplied, there are a bunch of such menu items - many of which are either home pages of academic institutions, or seem quaint and personal, but which remind you how small the web was in 1993. Mosaic 1.0 for Windows does include a bookmarking system, called a Hotlist. The example Hotlist includes a link to a page called babes.html - some things never change... There is also an annotate feature, which I think was meant to allow you store to comments on web pages, though I failed to get it working. No CSS of course, but you can change the font and size of the standard HTML styles though the Options dialogue. Sadly, few sites actually open today in Mosaic 1.0. Browsing to The Reg caused the mosaic globe to spin madly for a while, before giving up with a General Protection Fault. Mozilla.org, the spiritual successor to Mosaic via Netscape, came up with a 403 Forbidden error when viewed in Mosaic. Google’s home page is somewhat intelligible, though the search box does not appear. The best result I found was with a simple WordPress site I run, where at least you can read the text.